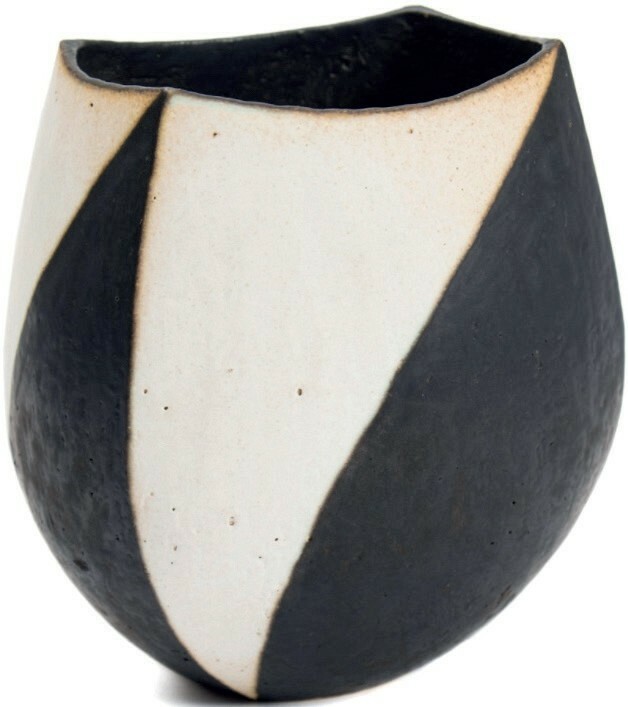 A monochrome creation by studio potter John Ward (b.1938) will feature in a sale of 20th century and contemporary art at Exeter saleroom Bearnes Hampton & Littlewood on December 4. The 7in (17cm) high stoneware vase has an impressed personal seal to the base and was purchased in 1986 from an exhibition in Beverley, east Yorkshire. This rare cotton chair cover above, which retains “a faint odour of perfume”, is believed to have been used by Queen Victoria at Windsor Castle. A letter accompanying the cloth states that it covered “the tub chair used by Queen Victoria at Windsor… [in her] sitting room” and was “used regularly until her last illness”. According to the note, the cloth was acquired by a palace servant called Mrs Davies, who asked her friend, a housekeeper at Windsor Castle, for “a memento of the Queen” after she died. 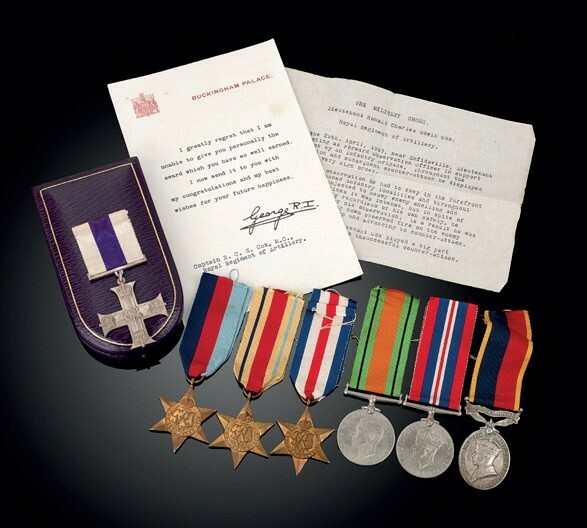 This Second World War Military Cross medal group above was awarded to Lieutenant Ronald Charles Edwin Cox of the Royal Artillery. According to dispatches, Cox displayed ‘courage of a very high order’ in bringing artillery fire as a forward observation officer in support of an infantry brigade near Enfidaville in north Africa on April 29, 1943. The group is estimated at £1200-1800 in a sale of antiques, silver and collectables at Fellows in Birmingham on December 4. Arms of a prosperous brewing family from London are seen on elements of this horse ‘caparison’ – the ornamental covering spread over a horse’s saddle or harness. 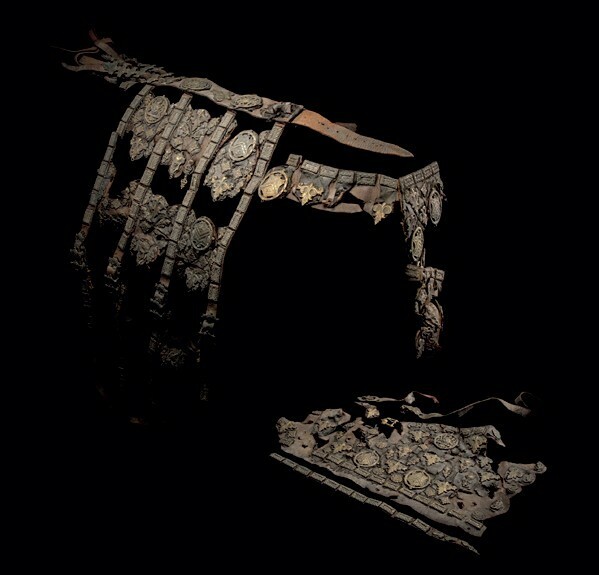 Dating from the first half of the 18th century, the velvet-covered leather piece retains eight gilt-brass plaques decorated in an openwork design with the arms of John Parsons (1613-1717) and his son Humphrey, who were part of the family that owned the Red Lion Brewery in East Smithfield. Sir John was knighted by James II and became a prominent figure in civic London, ultimately being Lord Mayor (1703-04) and then MP for Reigate in 1685. Humphrey continued his father’s success and made the brewery one of the largest in London in the second quarter of the 18th century. The caparison will go under the hammer at Thomas Del Mar’s Antique Arms, Armour and Militaria sale on December 5 at 25 Blythe Road in West Kensington, London.